The zenon Load Management uses sophisticated energy trend calculations to optimize energy consumption for electricity, gas and mixed equipment – and in an automated manner. 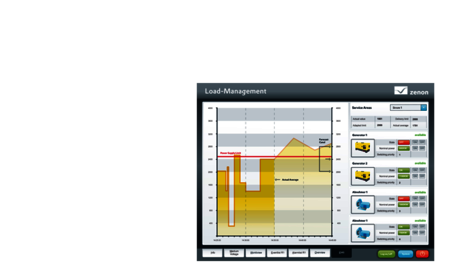 zenon Load Management calculates, based on current trends, the consumption for a previously defined time span and makes it possible for you to react in time, either automatically or manually. You can avoid load peaks effectively and reduce costs this way. The intelligent zenon Load Management takes over efficient energy consumption in an automated manner and makes it possible to use agreed amounts optimally, without exceeding them. This is how it works: zenon Load Management analyzes current use and creates a forecast for the remaining observation period using a mathematical model. If it forecasts load peaks that lead to the agreed amount being exceeded, it recommends switching actions or carries these actions out itself, if desired. In this way, non-essential consuming devices can be switched off during peak times and subsequently switched on when demand falls, or additional energy can be purchased in spot amounts. For gas grids, reserves can also be switched on and topped up later. For the prognoses, zenon combines different methods of trend calculation, from the output trend, to the calculation of the corrective actions through to the forecasting of the actual/real value – and also takes any lowering of consumption limits into account. Because Load Management is integrated in zenon, communication errors are eliminated. All components of an item of equipment can be taken into account by the Load Management and will contribute to overall equipment effectiveness (OEE). As part of this process, data from all modules is available centrally. A switching action in the Load Management is seen directly in the SCADA and vice versa; switching actions can be automated in a targeted manner and secured against incorrect operation. zenon supports the energy standards IEC 60870 and IEC 61850 and also provides a wide range of drivers. As a result, the most varied devices can be included within the scope of zenon Load Management without problems. This eases network operation, improves the availability of consuming devices and reduces energy costs sustainably due to precise control.